The Marché du Vieux Port on the Saint-André Quai in the heart of Quebec City is a huge, year-round market featuring the best of Quebec's farms and artisan food producers. Local produce abounds, to be sure, but so do regional specialties like fine cheeses, fresh seafood, and maple- and apple-based products to satisfy the culinary cravings of home shoppers and chefs alike. 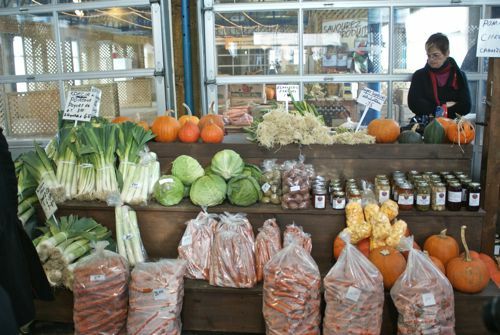 Know what local produce to expect and when with this guide to Quebec seasonal produce. This stand is typical of the produce stands in the farmers market section of the Marché du Vieux Port. During a visit in November, there was still plenty of variety because root vegetables can be harvested so late, greens can be kept going with hoop houses and other season extenders, and storage produce like apples and winter squash are still available from the earlier fall harvest. This vendor, like many others, augments her seasonal offerings with preserves and apple butter. An even greater array of seasonal produce was on display here—beets, carrot, cabbages, cauliflower, onions, parsnips, and, showing the French heritage just a bit, leeks! Our November visit meant that there were plenty—and we mean plenty!—of apples for sale. Spartans and Empires, Cortlands and Lobos were some of the most popular varieties on offer. Apple growers don't just sell fresh fruit, though, and apple butter, apple cider, ice cider, and apple brandy are on offer, too. This blueberry syrup is but one example of the incredibly wide range of products made from Quebecois produce available at the Marché du Vieux Port. Vinegars and syrups, fruit butters and preserves, liqueurs and brandies are all arrayed at different temporary and permanent stalls. A particular favorite regional specialty we discovered while wondering the market was maple liqueur. While it sounds like it would be cloyingly sweet, the one made by Val d'Amber was balanced and complex and absolutely lovely. The Gaspé Peninsula juts out into the Gulf of St. Lawrence, providing Quebec City (and Montreal) with plenty of fresh, delicious seafood. What attracted my attention most was the range of delicious Atlantic oysters, like the Beausoleil oysters pictured here. Many regional specialties are for sale at the Marché du Vieux Port, including various versions and sizes of the classic French-Canadian tourtière, a hearty meat pie often made at Christmas time. Can't make it to Quebec anytime soon? Try this recipe for a more traditional version. In the fine French tradition, Quebec is home to a great number of excellent artisan cheeses. Farmstead cheese is in great abundance at Marché du Vieux Port, with many sellers happy to give samples and talk about the cheese if you have questions. The Marché du Vieux Port is located at 160 Saint-André Quai in Quebec City. It is open 9 am - 6 pm Monday through Friday; 9 am - 5 pm Saturday and Sunday. Visit the market online at marchevieuxport.com.